Ca2+ is an important second messenger in many cells and in muscle it is the messenger that causes contraction. Ca2+ in muscle is stored in the sarcoplasmic reticulum (SR) and is released in response to electrical depolarization caused by an action potential. When the action potential depolarizes the L-type Ca2+ channel along the t-tubules, the conformation change it induces is transmitted to the Ca2+ release channel in the SR membrane (called the “ryanodine receptor“). The released Ca2+ binds to the troponin complex to activate the actomyosin ATPase, to cause contraction. Relaxation is caused by the reuptake of Ca2+ into the lumen of the SR, in a process that is driven by the SR/ER Ca2+ ATPase, or SERCA. 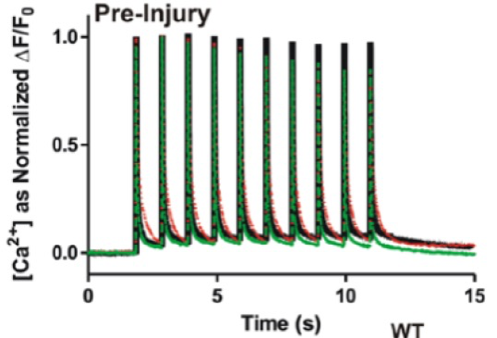 Thus, visualizing and quantitating the changes in Ca2+ in the sarcoplasm following excitation, during contraction and relaxation, and in the SR stores, is essential for understanding muscle function. 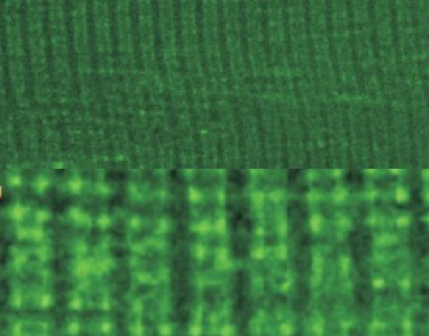 We have adapted methods used by other laboratories to visualize the stores of Ca2+ in the lumen of the SR (left panel; lower half shows a high magnification view of the upper) with a Ca2+ -sensitive dye called Fluo5N, and the changes in Ca2+ that occur during the action potential with a second Ca2+ -sensitive dye called Fluo4 (right panel; normalized traces are of healthy and dystrophic muscle fibers shortly after placement in culture; stimulation rate, 1 Hz). We are currently using these methods to study the organization and function of the SR in muscle cells lacking sAnk1, and the changes in Ca2+ regulation in dystrophic muscle fibers, especially those missing dysferlin.